Recombinant protein fragment, corresponding to a region within C terminal amino acids 916-1137 of Human MSH3 (UniProt ID: P20585). 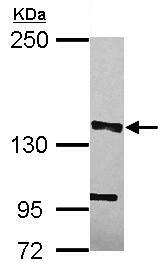 A431 whole cell lysate (ab7909) can be used as a positive control in WB. A549 cell lysate; HeLa cells; Human colon carcinoma tissue. Our Abpromise guarantee covers the use of ab154521 in the following tested applications. WB 1/500 - 1/3000. Predicted molecular weight: 127 kDa. Component of the post-replicative DNA mismatch repair system (MMR). Heterodimerizes with MSH2 to form MutS beta which binds to DNA mismatches thereby initiating DNA repair. When bound, the MutS beta heterodimer bends the DNA helix and shields approximately 20 base pairs. MutS beta recognizes large insertion-deletion loops (IDL) up to 13 nucleotides long. After mismatch binding, forms a ternary complex with the MutL alpha heterodimer, which is thought to be responsible for directing the downstream MMR events, including strand discrimination, excision, and resynthesis. Defects in MSH3 are a cause of susceptibility to endometrial cancer (ENDMC) [MIM:608089]. Belongs to the DNA mismatch repair mutS family. MSH3 subfamily. Immunofluorescence analysis of paraformaldehyde-fixed HeLa cells, labeling MSH3 using ab154521 at a 1/500 dilution. 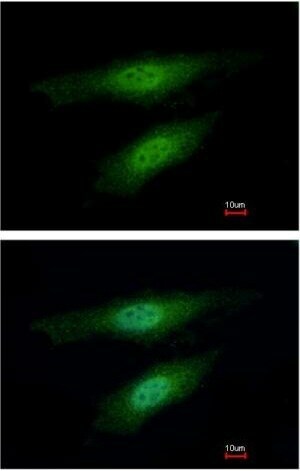 image in the lower panel was costained with Hoechst 33342. 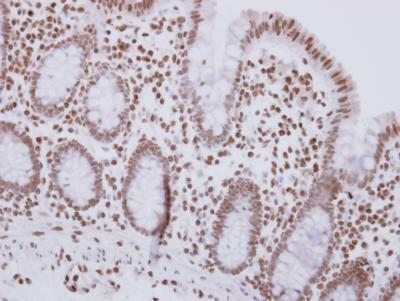 Immunohistochemical analysis of formalin-fixed, paraffin-embedded Human colon carcinoma tissue, labeling MSH3 using ab154521 at a 1/500 dilution. ab154521 has not yet been referenced specifically in any publications. Publishing research using ab154521? Please let us know so that we can cite the reference in this datasheet. There are currently no Customer reviews or Questions for ab154521.